Thailand’s military junta, also known as the National Council for Peace and Order (NCPO) came into power after a coup in 2014. Since then, it – under the leadership of Prime Minister Prayut Chan-o-cha – has received both criticism and praise from people inside and outside the country. Say what you like but the NCPO has shown initiative in leading Thailand in the right direction when it unveiled its master plan for the country’s future two years after it took control. In 2016, the military government unveiled its newest economic initiative dubbed “Thailand 4.0”. 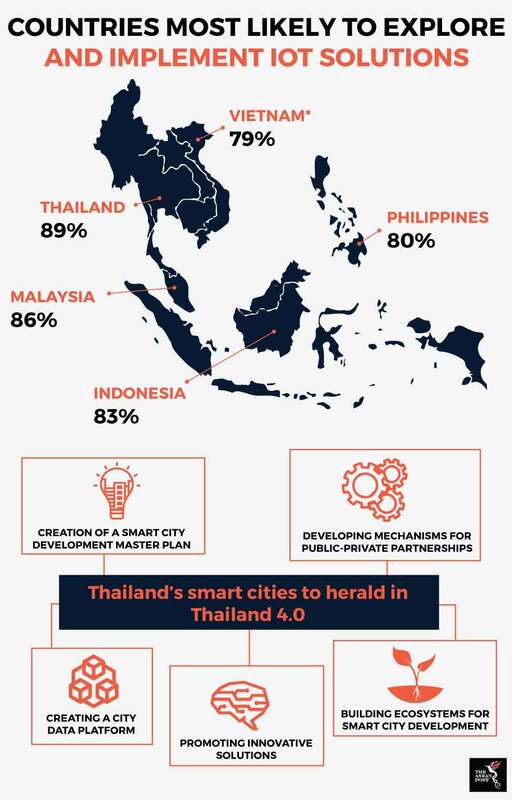 The initiative was a master plan to get the country Industry 4.0-ready with the ultimate aim of freeing the people of Thailand from the middle-income trap by making the country a high-income nation in five years following the inception of Thailand 4.0. Several different yardsticks have been used to measure the country’s success in realising the Thailand 4.0 initiative. The ASEAN Post has already outlined several obstacles in the path of making this vision a reality, as well as the opportunities that Thailand could bank on. Recently, however, a study has shown that the country is indeed heading in the right direction. A recent survey conducted by the Asia IoT (Internet of Things) Business Platform in 2017 found that out of the countries surveyed, companies in Thailand were the most likely to explore and implement IoT solutions. According to the survey, 89 percent of companies in Thailand were ready to explore and implement IoT solutions compared to 86 percent in Malaysia, 83 percent in Indonesia, 80 percent in the Philippines, and 79 percent in Vietnam. The Asia IoT Business Platform also forecasts that IoT spending in Thailand is set to increase by 1,600 percent by 2020.